This company has operated on responsible tourism values since its inception. To reduce the amount of waste created on tours, tour leaders also encourage travelers to use refillable water bottles instead of disposable plastic, cotton tote bags, reusable batteries, etc. We also include destination-specific information in our guidebooks, which are provided to each traveler including information particular to the local culture and environment and tips on how to be a responsible traveler. Low Impact Transportation: Using public transport is the most sustainable way to go – after walking and cycling of course! Its important we support our local destinations and better yet, get right in the middle of things. 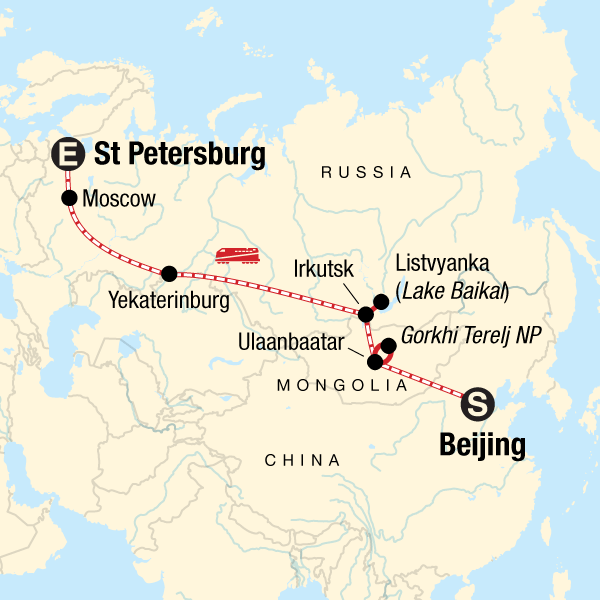 On this trip you’ll be taking the train across Siberia and Mongolia, traveling as locals do, with low impact in emissions and high impact in culture! The Trans-Mongolian Express is all about community! Imagine spending days with native Chinese, Mongolians and Russians making their way across Siberia and Mongolia to visit friends and family. This trip provides such a unique experience to support community, not only through economic means but through communication, sharing and impacting the personal spirit. Your local homestay in the Siberian town of Listvyanka means a lot to your host as it is his way to travel the world without leaving home. You will be guaranteed to walk away from this trip forever changed! Don’t forget about one of the highlights of this trip; the world heritage sites forever protected by UNESCO via your continued support. Beijing has the famous Great Wall, Tiananmen Square, the Forbidden City, and Temple of Heaven. There is also the World Natural Heritage Site of Lake Baikal in Siberia, and the famous World Heritage Sites of Saint Petersburg, Moscow’s Kremlin and Red Square, among others.